The Tooth Fairy does exist, and she’s helping a number of cats and dogs at Best Friends Animal Society’s sanctuary. 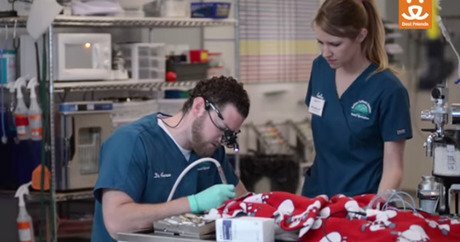 In fact there are several tooth fairies: All have taken the form of animal dentistry experts who traveled from southern California to southern Utah — the home of Best Friend’s Sanctuary — to perform 60 dental exams. The Sanctuary at Best Friends in Kanab, Utah, has 1,700 companion animals of various species, including dogs, cats, rabbits, pot-bellied pigs, horses, goats, and exotic birds. Many of the rescued animals who arrive at the sanctuary often come from cases of abuse or neglect — that often translates to a lot of teeth needing dental work. Dr. Michael Dix, DVM and Best Friends Animal Society’s medical director, notes, “It is wonderful that Dr. Niemiec helped organize a group of veterinarians who are experts in this field to come out to the sanctuary to help us get caught up on our dentals and to provide us with up-to-date knowledge on dental care. In addition to helping the dogs and cats at Best Friends’ Sanctuary, as well as local shelter animals in southern California, Southern California Veterinary Dental Specialties & Oral Surgery started a “Pet’s Tooth Fairy Fund”to help pets whose owners cannot afford advanced dental treatment. For more information, contact [email protected]. Dental disease is the most common problem affecting dogs and cats. Not many people know this, but the oral cavity is the fourth most common site in the body for cancer. Despite the fact that most oral infections are painful, pets often suffer in silence because the infections are not visible. Treating dental problems is easy, and results in happy and healthy dogs and cats. If you suspect your pet has a decaying tooth or other dental problem, consult with a dental specialist — they are better trained than general practitioners on how to handle these issues.